Namaste! Thank you for visiting. To study the subject of yoga in Detroit and Hamtramck visit Iyengar Yoga Detroit, a center dedicated to the study and practice of Iyengar Yoga. Shri B.K.S. Iyengar (1918-2014) developed a systemized practice of over 200 classical yoga asanas and 14 types of pranayamas. We offer beginning and experienced level classes as well as gentle yoga classes, yoga for athletes, and for injuries and chronic conditions. Concise, systematic, individualized instruction allows the student to perform each pose in an anatomically intelligent way for safety and maximum benefit. 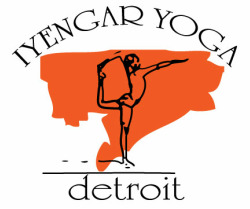 Iyengar Yoga Detroit provides an environment for structured, regular yoga practice. With a consistent practice, the student will notice increased strength, flexibility, stamina and poise. As your practice continues the external body benefits and begins to penetrate inward improving the function of the respiratory, circulatory, digestive, and hormonal systems. Harmony and balance of the physical body brings emotional stability and clarity of mind.